At Macildowie we have built our reputation as one of the UK's leading independent recruitment businesses. We built our reputation as the go-to recruitment brand in the East Midlands, expanding into Milton Keynes and the Home Counties in 2015. We pride ourselves on the quality of the service that we offer to our customers, developing strong, ongoing relationships with our clients and candidates ensuring they trust us to meet their needs. Having built an unrivalled Customer Value Proposition for our candidates and clients we believe that we're different to other recruitment businesses, many of our customers would also agree. In particular, we recently won an award in recognition of the added value consultancy workshops we have been running since 2008 and have also been shortlisted for the Recruiter Awards 2016 for ongoing excellence regarding "Client Service". Our candidate workshop is called - How to improve your Personal Brand and network using Linkedin. Our client workshop is called - How to use Linkedin to Recruit for Free. Mindmill allows us to open up new talent pools of candidates, for our clients, based upon their behavioural match to the culture of the recruiting company. To read more about Mindmill - click here. Our Linkedin workshops have been referred to as "counter-intuitive", but we believe it is proof that we do work differently in order to build long term, sustainable recruitment relationships built on trust. Our customer first approach recently led to our win at The National Online Recruitment Awards - we came first in the 'Best Large Recruitment Agency' category. Business and Operational Support jobs. We take a personal approach to our work and ensure we have a complete understanding of our clients and their business needs. This helps us deliver winning results with some of the best companies in the Midlands and Home Counties ranging from SMEs to FTSE 100 businesses. Our clients include E.ON, Paul Smith, Vision Express, Capital One, Barclaycard, Coors, Next and Boots among many others. The consistent high level of service we offer, alongside our unrivalled client portfolio, means candidates of the highest calibre come back to us time and time again. Our people are at the centre of our brand values. We focus on the continuous improvement of our culture and Employee Value Proposition. Adopting this strategy has led us to receiving the highly coveted “Extraordinary” 3 star status on each of the six occasions that we have entered the Sunday Times Top Places to Work awards. Our 2019 success led us to be the highest ranked Nottinghamshire business and the highest ranked recruitment agency in The East Midlands. 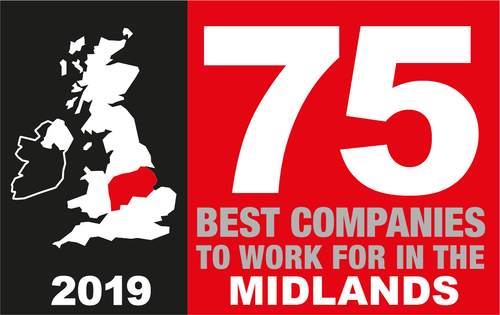 We were also named the 3rd best company to work for in The Midlands in 2019. We are committed to ensuring Macildowie is a great place to work with highly trained staff, this means we can guarantee that you will be looked after by a passionate professional who will do their utmost to exceed your expectations. Our 2019 success led us to be the highest ranked Nottinghamshire business and the highest ranked recruitment agency in The East Midlands. We were also named the 3rd best company to work for in the midlands.